On Thursday 14 November we welcomed Alana Robinson from the Teenage Cancer Trust, who gave a presentation to our S2 year group. This was a really informative and engaging presentation, drawing pupils attention to the early signs of potential cancer, raising awareness of the tireless pursuits currently undertaken to help prevent and treat cancers, and signpost people and organisations that can support young people who have concerns. 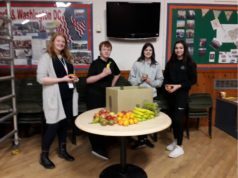 In support of this presentation, Tesco generously donated a significant quality or fresh fruit, allowing each pupil in S2 to take advantage of a healthy snack. Alana was blown away with this kind and thoughtful gesture, and thrilled with the high level of pupil knowledge, engagement and impeccable behaviour.